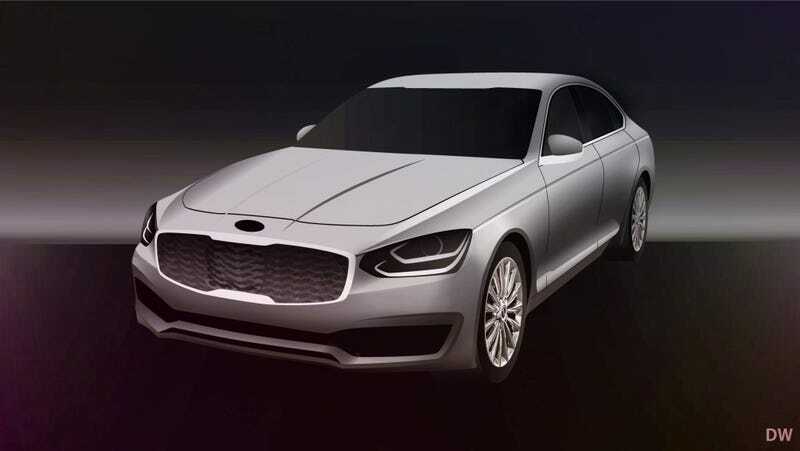 The successor to the Kia K900 will appear early next year. We probably won’t get it in the US during 2018 but it will likely come purely to establish the new nameplate. It’s been apparent since the Stinger “E” badges appeared that Kia Korea is entering the early phases for launching a premium brand (subbrand really) by 2025. Whatever the K900 successor is called will likely set the tone for the name of the new brand. The K900 successor has an interesting designation as “RJ.” I’ll get into what that hints towards later but for now you can expect that everything you can get on the Genesis G80 will be available in the big Kia including an AWD system, the 3.3t V6, and the Tau V8. The new things will likely be a 10-speed auto, Kia’s next level of autonomous tech/driver aids/safety systems, connectivity, and the usual marketing fap fest riddled with delirious yet whimsically ironic Walt Whitman-like passages. Back in 2015 — which was around the time when the Stinger was originally going to launch — Kia Korea was working on a name like Esentus, Esensus, or Esencis (basically Essence/Essential) to house their premium RWD vehicles. I hope those names are tossed for a word with meaning rather than a noise harbled together from words with meaning. I do think a subbrand would be a better move than a spin off though. Thankfully it seems that’s the way the stormtrooper hits the tree, as they say! This is one of times where I put two posts into one large post. Im going to talk about why the RJ designation is notable. Kia designating the car the “RJ” is important because it denotes a new platform group. We are getting to the point where saying this platform is shared with the Genesis G90 wont be accurate (though saying it is shared with the Genesis G80 would be closer). You had the first generation Hyundai Genesis Sedan as the BH. Kia got the platform to develop the K900 and Hyundai used it to make the Equus. Since the aims were so close you can call them the same car even though each brand did their own thing with what they had. Now you have Kia taking that K900 platform and developing a new car from that instead of directly being given the G90 platform that was evolved from the Equus. Since you have the brands working off their own projects you end up with every generation being pulled further and further away from the sibling’s similar project. That’s the reason why you’ll probably start hearing Genesis say they don’t share a structure with Kia though the platforms are related through a common starting point. This will be especially true when the Kia K900 successor comes out and everyone says that its platform is shared with the Genesis G90. At that point, through so many tweaks, the two cars will be the least similar platform competitors within the Hyundai Motor Group trio. It’s pretty interesting stuff and the same is true between Audi, Porsche, Bentley, and Lamborghini. They will market the benefit and advancement of platform sharing for the first few cars. Time and new cars will come out from every brand and after awhile the platforms diverge so much that the brands will have a unique platform. Then the market changes and we start the process over again. Hyundai has had about a decade with RWD cars now so this is sort of the genesis of moving upmarket and it all came from the Genesis Sedan. Im just tossing the cars in that Im 85% certain will appear in the next two years. It is neat to look at how much has come out of and evolved from the Genesis Sedan and Genesis Coupe since they started being built back in 2008.